Two additional new generic Top Level Domains have become available for registration by the general public. The first seven days of a new gTLD’s general availability are called Early Access Registrations when domain names can be registered at higher costs. 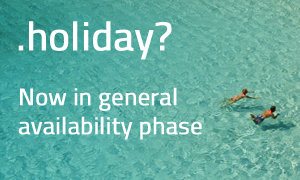 The two new gTLDs are: .HOLIDAY and .MARKETING. They have joined forces with five other new gTLDs that have recently been released for general availability: SOLAR, .COFFEE, .HOUSE and .FLORIST. Registration for the above domains is offered to businesses, organizations and individuals on a first-come, first served non-restricted basis. To check if the domain name of your choice is available for registration, please enter the name in the box or contact our Support Team at support@web-solutions.eu or via phone on +44 (0) 208 133 3994.